To make sure you’ll be able to jog your memory quickly, you might want to go for an actual jog a little after learning something. Healthy volunteers that exercised four hours after learning patterns had better recall 48 hours later than those that didn’t exercise at all or exercised directly after learning. The delayed exercise may spur the release of molecules that boost the brain’s normal ability to consolidate and bank memories for long-term storage, researchers report in the journal Current Biology. If the finding holds up in further studies, it may suggest that working out a little after cramming could help bulk up your noggin. For the study, researchers had 72 healthy volunteers spend 40 minutes learning the location of 90 objects on a screen—like a cartoon beach ball on the center right. The researchers immediately tested how well each participant did learning the objects’ locations, then split up the participants into three groups. One group went directly into a 35-minute interval training on a stationary bike (with an intensity of up to 80 percent of their maximum heart rate). The second group went into a quiet room and watched nature documentaries until it was time for their four-hour delayed workout. And a third group acted as the control group, which just watched nature documentaries and hung out—but didn’t work out—in the gym. 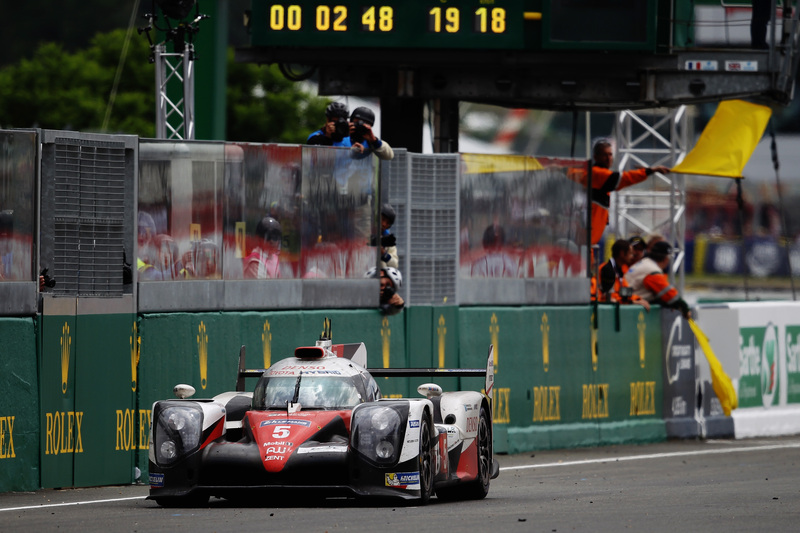 Race leader Kazuki Nakajima of Toyota Gazoo Racing suffers engine problems with less than 3 minutes to run of the Le Mans 24 Hour race handing victory to the Porsche Team. The 24 Hours of Le Mans holds a special place in our hearts. More than any other race, it’s a crucible in which new technology is forged, technology that’s directly relevant to the cars you or I drive on the road. And for 23 hours and 57 minutes, this year’s race belonged to Toyota Gazoo Racing, which put on a fine show with its pair of TS050 hybrid race cars. But racing can be a cruel, cruel sport—something I know all too well—and this year was crueler than most. The race got underway on Saturday during torrential rain, with the first 50 minutes or so conducted under a safety car as the ACO (the race organizers) waited for the track to dry sufficiently for things to get going properly. At the front of the field the battle for the overall win was one fought between Porsche and Toyota with their hybrid LMP1 prototypes. Both of Audi Sport Team Joest’s R18 hybrids faltered early on, as did the #1 Porsche 919 Hybrid, but the remaining three cars (the #5 and #6 Toyota TS050s and the #2 Porsche) stayed in close contention with multiple lead changes between them throughout the course of the race. The #5 Toyota of Sebastien Buemi, Anthony Davidson, and Kazuki Nakajima looked set for victory after a strong performance in the final quarter of the race. The Toyotas were able to run for 14 laps between fuel stops—one more than either the Audis or Porsches, and the #5 stretched a lead over the #2 Porsche 919 Hybrid (Neel Jani, Romain Dumas, and Marc Lieb) and its sister TS050 (Mike Conway, Stéphane Sarrazin, and Kamui Kobayashi) until it all went tragically wrong halfway around the penultimate lap. A third of the way down the Mulsanne Straight, with Nakajima at the wheel, the #5 Toyota started losing power. In short order, its 50-second lead over the Porsche evaporated, and the car came to a halt just past the finish line—with three minutes still on the clock. British Prime Minister David Cameron warned that the debate on Britain’s European Union membership must not be based on “intolerance, hatred and division.” Rough Cut (no reporter narration). The Iraqi army is conducting security screenings, looking for Islamic State fighters disguised as refugees fleeing Falluja. Nathan Frandino reports. People gather in Rome, Paris and Berlin to send a chain of love and kisses to Britain, to show how much they want Britain to stay in the European Union. Diane Hodges reports. E-mail clients are a personal thing. Something I love is not necessarily something you love, and I’m okay with that. Maybe I’m just picky, but I am an equal opportunity hater when it comes to email clients, and I’ve tried quite a few. A couple of years ago I stumbled upon Airmail and never looked back. Bloop just released Airmail version 3.0 last month. Back in the day I used Eudora, but I’ve also used Thunderbird, Outlook, and Apple’s own Mail client. In Mac OS 9 days, I even tried out a client called Nisus Email. There are many more that have briefly messed up my inbox and then gone. 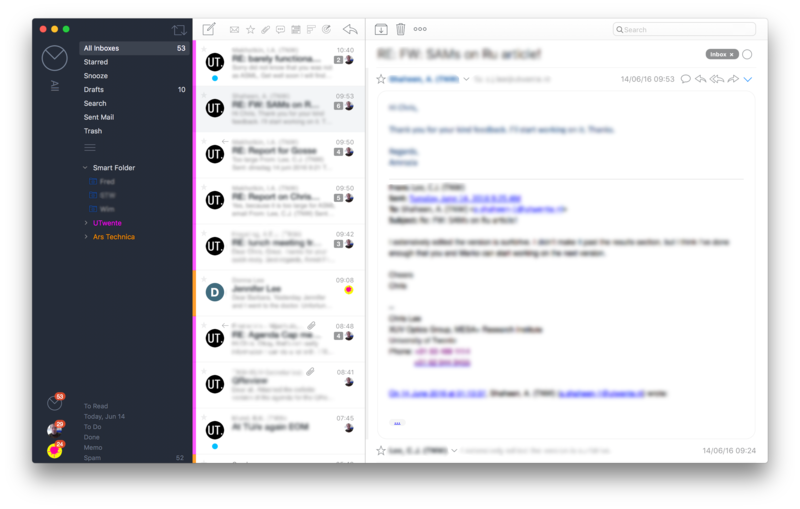 I don’t mind paying for an e-mail client, but it has to do its job the way I want it to. So what do I want it to do? The first thing is that it should not be integrated with its own calendar or to-do list. This sounds strange, but I often find myself reading an e-mail that has a list of dates and times for a possible event. In an integrated client, I have to flip back and forth between tabs to really check those dates. Sure, you can usually get a mini-calendar to one side, but then you have to click through day-by-day. If the applications are separate, I can put them side by side and get a much clearer view. This works especially well when I have more than a single screen available. The Centers for Disease Control and Prevention is sounding the alarm over a recent uptick in outbreaks of turtle-related infections. Outbreaks in these infections largely involve kids. Specifically, the wee, shelled reptiles sparked 15 multistate outbreaks of Salmonella infections between 2006 and 2014. According to the CDC’s report in this week’s edition of Emerging Infectious Diseases, turtles caused a total of 921 illnesses, 156 hospitalizations, and the death of an infant. The median age of a those sickened in the 15 outbreaks was 10. The agency noted that the outbreaks seem to be increasing since 2006, with eight in 2012 alone. And according to another recent CDC report, there were four additional multistate outbreaks between January 2015 and April 2016, sickening 133 people in 26 states. Forty-one percent of cases in those four outbreaks were kids under the age of five. WASHINGTON (Reuters) – The U.S. Supreme Court may weigh in this week on gun control, an issue smoldering again following the June 12 Orlando massacre, with the justices due to decide whether to hear a challenge by gun rights advocates to assault weapon bans in two states.